When preparing for working or travelling abroad, it is important to consider the infectious diseases prevalent around the globe, such as malaria, dengue or Zika, to which you may be subjected. 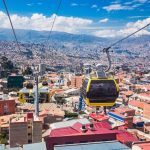 However, another important but often-neglected factor that can cause severe illness is the altitude of the town or city that is being visited. Whether you are doing business in Bolivia, working as an engineer in the mines of Peru, or skiing in Aspen, ignoring altitude can be very serious: every year people die from altitude sickness. Altitude sickness is caused by a decrease in oxygen to the body’s organs. Although the overall percentage of oxygen in the air at altitude remains the same as at sea level, the air pressure is lower (‘thinner air’), so gasses take up a larger volume. This means that at altitude each breath contains fewer oxygen molecules and as a result, the body becomes increasingly depleted of oxygen the higher the individual ascends. How this leads to altitude sickness is not fully understood, but in this low-oxygen state, blood vessels can become leaky leading to accumulation of fluid in the lungs or brain. The effects of altitude sickness are well-known, however. Signs can range from a slight headache similar to a hangover, to losing the power of speech or slipping into a coma while you sleep. About 20% of people only experience mild symptoms at altitudes between 2,200m to 2,500m above sea level. The risk of altitude sickness in areas such as Nepal and the Andes mountain range is significant, where the regions can be as high as 3,000m to 4,000m. The death rate is around 4 percent for trips to peaks above 7,000m. Table 1: Popular geographic locations listed by maximum altitude. Fluid on the lungs or HAPE (high-altitude pulmonary edema). A minority of people can develop symptoms of altitude sickness at altitudes around 2,500m, especially if they sleep there. Symptoms typically occur 6-12 hours after arrival at altitude, but can begin more than 24 hours after ascent. However, most people will acclimatize up to 3,000m with relative ease. Acclimatizing to heights of 3,000m to 5,000m is much more difficult: at these altitudes it is absolutely essential to ascend slowly and return to a lower altitude to sleep if travelling around at a higher altitude during the day. Over 50 percent of people will become ill if they ascend rapidly from sea level to 3,500m without acclimatization, whereas almost everyone will get altitude sickness if they ascend rapidly to 5,000m without acclimatization. It is thought to be impossible to remain well at heights above 5,500m without spending at least a week acclimatising. It is possible to spend several weeks sleeping as high as 6,000m once acclimatised, however, but gradual deterioration of physical well-being will still occur. Regions above 7,500m are referred to as the death zone. At such a high altitude there will be noticeable deterioration with some of the body’s major systems: organ function will shut down and climbers will only be able to remain there for two or three days. Death rates from altitude sickness above 7,000m are estimated at 4 percent of all people who venture that high. Each year, out of 50,000 travellers to Nepal, there are at least seven altitude-related deaths. AMS is the most common response to altitude. It is a collection of signs that the body is becoming ill and not adapting to a higher altitude. Although mild AMS is unpleasant, it is usually self-limiting and resolves over a few hours or days if no further ascent is made. Paracetamol or ibuprofen is often used for symptomatic relief. However, it is important to be aware that around 10 percent of individuals will go on to develop the more serious complications of HACE and HAPE. If AMS does not resolve, it can progress to HACE (high-altitude cerebral edema). At this point, swelling of the brain occurs, affecting cerebral function. High-altitude cerebral edema occurs in about 1 percent of climbers ascending over 3,000m. This is a life-threatening condition and requires urgent action. HACE has been identified as the leading cause of death in attempted or failed ascents of Everest. Drowsiness, convulsions, loss of consciousness and ultimately coma and death. Descend immediately in the presence of symptoms of HACE or HAPE, always accompanied by others and preferably by stretcher (although this must not delay the descent). It is difficult to predict who will be susceptible to AMS. It is interesting to note that physically fit travellers are not necessarily at lower risk. The best indicator of how altitude will affect a traveller is previous experience at altitude. Although people who live above sea level have a definite advantage on ascending to higher elevations, they are not exempt from altitude problems; it just pushes the threshold for its onset higher. Altitude at which a traveller sleeps. Altitude sickness is made less likely if a slow ascent is carried out. Ascent from below 1,200m to above 3,500m in a single day is not recommended. Above 3,000m care should be taken not to ascend too rapidly. The altitude at which travellers overnight is most important: above 3,000m this should not go up by more than 500m per day. Every three or four days travellers should have a rest day with no further ascent. Some climbers take a drug called “Diamox” (acetazolamide). This is unlicensed for treatment for prevention of AMS in the UK, but is used effectively by many climbers. It should be started 1-2 days prior to ascent. It is unknown how Diamox works in this context but it is probably due to the medication’s ability to alter the acid-base balance in the blood. This balance is often affected as altitude is gained, since mountain walkers can exhale large volumes of carbon dioxide (an acidic gas) as their breathing rate speeds up in an attempt to increase the amount of oxygen taken in to the body. Diamox is known to often cause some side effects however, such as tingling fingers and feet, which can be unpleasant. There is a lack of data on the effects of exposure to high altitude during pregnancy. Even though short exposures appear to be tolerated well by healthy pregnant women, it is prudent to avoid travel to high altitude during the first trimester. Pregnant women who are anaemic, carrying more than one baby, or who have been diagnosed with a condition that reduces the oxygen supply to the foetus, are advised to avoid high altitude travel. Another consideration is that travel to altitude is often remote and access to medical facilities in the event of an obstetric emergency will be difficult. Both experienced mountaineers on Mount Everest and vacationers hiking through the mountains of Peru for leisure, have died of acute altitude sickness, but these were temporary visitors to high altitudes. Many assume that those who live their whole life at high altitudes — especially those who have lived there for generations — have either adjusted or adapted to their low oxygen environment. This is not necessarily the case. While people living on the East African Plateau seem entirely free of altitude sickness, people living in Tibet do sometimes have chronic sickness, and those living in the high Andes experience it quite frequently. These indigenous peoples who experience mountain sickness are often sick their whole lives, and tend to die of strokes much younger than those who don’t have the condition. A team of researchers from The University of California at San Diego studied the genetics of both the sick and healthy populations of people in the Andes. They found two genes that both seemed to make this ‘chronic’ mountain sickness more likely. Both sick and healthy people had these genes, but those with chronic altitude sickness had significantly increased expression of those genes. When the team researched this phenomenon in modified fruit flies, they found that those flies with suppressed genes survived hypoxia (low oxygen in the body) much better. Whatever the genetic cause of mountain sickness turns out to be, individuals can be treated with a combination of descent from altitude and medication. For mild cases at low altitudes, ibuprofen is often effective in treating the symptoms. One study found that a dose of ibuprofen reduced the rate of mild altitude sickness in hikers by up to 25 percent. Researchers believe that it reduces the swelling in the brain, although if these symptoms were experienced at the start of a long trek to high altitude, ibuprofen was shown to be of no benefit. For those who get symptoms of acute mountain sickness at low altitudes: medication will not help, descend immediately. Altitude sickness is relatively unstudied because of how quickly and unpredictably it goes from nausea, to coughing up blood, to death. Even those who take the time to acclimatize can suddenly and violently get sick. Any sign that you have more than a mild headache means it’s time to descend and accept that the mountain has won!